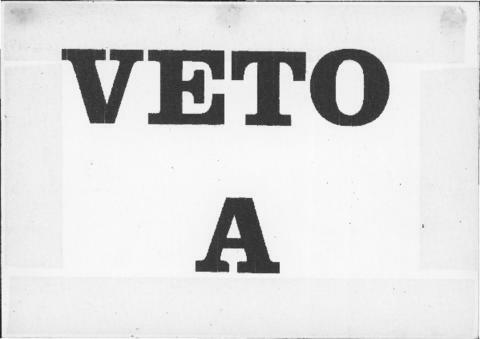 Item is a flashcard with the text "VETO A" on both sides. It is used in conjunction with flashcards "VETO B" and "VETO C" in parts 1 and 7 of the composition to interrupt the normal flow of the music. When the conductor implements VETO A, the orchestra switches to "single focus gestures," which are represented on the score for parts 1 and 7 by a subito fortissimo (sff) sign and graphic notation showing seven arrows pointing at a black dot.